Albania - Lake Shkodra Resort, Shkoder, Albania. Camping, Glamping Hotel, Lodge, Holiday Accommodation. Restaurant & Bar. Excursions to Lake Koman, Shkoder, Thethi & Kruja. Thethi Guesthouse Hotel Booking. Climate - A Mediterranean climate with long hot summers and rain unusual in the summer months. Vlora, Albania (229km) to Brindisi (Italy). Taxis are widely available and can be booked through Lake Shkodra Resort to pick up from airports or other destinations. Car hire is available at Tirana airport from car hire companies such as Hertz and Europcar. Minibuses `like dolmuses’ can be flagged down at the side of the road. They are cheap and frequent, passing every 3-4 minutes. A journey from the public road near the resort to the center of Shkodra costs approximately €0.40 per person and takes 10 minutes. A single trip to Tirana airport currently costs €8. Mountain bikes & canoes can be hired from the reception. Albania is a small thin country and has over 360km of unspoilt Adriatic and Ionian coastline, uninhabited islands, lakes, mountains, nature reserves and UNESCO world heritage sites. UNESCO world heritage sights include – Butrint, famous for its ancient Greek and Roman ruins, which include a Roman amphitheater, public baths and early Christian basilicas. Berat for its well preserved 13th century town and Gjirokastër or Gjirokastra for its Ottoman architecture. With long stretches by the Adriatic, a fascinating history, and only a few inquisitive travellers, Albania is ripe for exploring in 2015, writes Caroline Shearing. 4. Albanian Coast - On a rugged shore, Europe at its best. What if you could combine the rugged beauty you’d find on Croatia’s Dalmatian Coast with the ruins of an undiscovered Turkey or Greece, all wrapped in the easygoing nature characteristic of rural Italy — at a fraction of the cost? Turns out you can, on the coast of Albania. The roughly Maryland-size country, between Greece and Montenegro, sits about 45 miles east of Italy on the eastern shores of the Adriatic and has limestone-ringed beaches, ancient ruins like Butrint and waterfront inns where you can stay for less than $50 a night. Rampant development threatened to turn it all to concrete in the years after Communism, but a new government took office in September on promises of keeping the coast authentic. Head to villages like Qeparo, within sight of Corfu, where you can kayak past Cold War submarine tunnels, swim by abandoned forts and watch the tide rise during a dinner of fresh fish at an inn called the Riviera. This is Europe when it was fresh and cheap. Unfairly shunned by many tourists because it’s seen as dangerous or backward (neither of which are true), Albania offers secluded beaches, locals who take a genuine interest in travelers, tasty Turkish-style food, Ancient Greek ruins and Ottoman towns. Imagine a trip to the Balkans before it got discovered and you've pretty much got it, with prices to match. “Albania – Number 1 !! 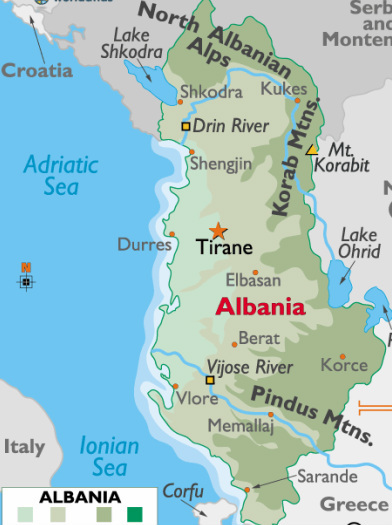 !” Lonely Planet’s Best in Travel 2011 has awarded Albania the number one spot in the top 10 countries for 2011. "Not so long ago, when the Balkans were considered an ‘only for the brave’ travel destination, only the bravest of the brave trickled into Albania. Since backpackers started coming to elusive Albania in the 1990s, tales have been told in ‘keep it to yourself’ whispers of azure beaches, confrontingly good cuisine, heritage sites, nightlife, affordable adventures and the possibility of old-style unplanned journeys complete with open-armed locals for whom travellers are still a novelty. Sick to death of being dismissed with blinged-up crime-boss cliches Albania has announced ‘A New Mediterranean Love’ via its tourist board. The jig is almost up – Albania won’t be off the beaten track for much longer". CNN picked only 9 top destinations for travellers in 2011, and two Eastern European countries are on that list: Albania and Bulgaria. The list was made based on expert recommendations from Robert Reid, U.S. travel editor for Lonely Planet; Pauline Frommer, creator of Pauline Frommer’s guidebooks; and Martin Rapp, senior vice president of leisure sales at Altour. Other top 2011 travel destinations were New York, New Zealand, the Peruvian Amazon, Spain (Barcelona), Norway, Japan and Guatemala. Albania was ranked 6, and Bulgaria finished the list last. Albania was also the top pick on Lonely Planet’s top ten countries for 2011, while Bulgaria ranked fifth. The two are the only Eastern European countries that got the media attention as potential travel destinations at the end of 2010, beginning of 2011. While Bulgaria has a strong tourism tradition, for Albania, the mention could be the beginning of a trend. 2. Adriatic coast, Albania. Had enough of Hvar and bored of Brindisi? Try Albania. With 380 miles of coastline, and its fair share of pretty seaside villages and Roman ruins, the Adriatic underdog is being touted as the next Croatia among adventurous beach-seekers. A new seven-night break is a good introduction, taking in historic towns, Byzantine and Ottoman remains and numerous white-sand beaches, lagoons and bays. Dead calm: Albania's Lake Koman. The surface of the lake is perfectly still. The steep hills on either side and the high mountains beyond are empty of human life, save for the occasional lonely farmstead embedded in the hillside. There are no visible roads, no telephone wires to connect this place to the outside world. It's not difficult, on the ferry journey along Lake Koman in northern Albania, to imagine you're drifting through a landscape that has lain undisturbed for centuries. It's the height of summer but there aren't many people on the ferry either. Most of our fellow passengers on this hulking cargo ship are down below, smoking and drinking lethally strong coffee in the bar. They've seen it all before. Those who haven't – my girlfriend and I, a few backpackers and some tough-looking Czech bikers – are on the upper deck drinking in the staggering scenery. Our first port of call had been Shkodër, the largest city in the north, overlooked by an impressive medieval castle built by Venetians, and crisscrossed by wide communist-era boulevards. When its population emerges in the evening to promenade and gather outside cafés, you could imagine you were somewhere in Italy – until you hear a muezzin's call from one of the city's many mosques, or fix your eye on a building that looks like it was transplanted from 1950s Moscow. We planned to strike out the next morning for the Albanian Alps in the north-east. The best way to get there, if you want to avoid a long, precarious road journey, is by the Lake Koman ferry. But we had no idea how to get to the lake, couldn't find an information office, and even the guidebook was sketchy on the subject. Eventually a taxi driver with a few words of English called a friend and arranged for us to be picked up early the next morning. This was typical of our experience. Ask someone on the street and, even if they can't help, they'll find someone whose second cousin definitely can. If helpfulness and hospitality were a marketable resource, Albania would be rich. It was 6.30am when George, a cheerful man with a thick moustache, ushered us into his minivan outside the Rozafa Hotel. At 6.32am, we drew up alongside a café on the same street and George treated us to early-morning espressos accompanied by shots of Metaxa brandy. At 7.15am, we were finally good to go. In the Albanian Alps Lake Koman was created by a dam – a major hydroelectric project built in the 1980s. An hour into the ferry journey, the tree-lined hills give way to sheer limestone cliffs which gradually close in until it looks like you've run out of lake. Just as you conclude you're heading straight into the side of a mountain, the water opens up again and you turn into a narrow passageway between two vertical walls of rock. It's like the riverboat sequence in the first Lord of the Ringsmovie. Even the Czech bikers were gaping. The Valbona valley, at the heart of the Albanian Alps, is a two-hour drive from the ferry's Fierzë terminus. It's flanked on each side by high mountains. The elevation was so dramatic that we had to crane our necks to see their craggy peaks. We spent several nights at a friendly little chalet-style hotel called Rilindja, hiking around the local villages and eating fresh river trout. And yet we'd seen only a fraction of what the country has to offer during our 10 days here. We missed out on the fine beaches (it has a coastline that bridges two seas – the Adriatic and the Ionian), the Greek and Roman ruins at Butrint, the town of Gjirokastra (Nobel laureate Ismail Kadare, who was born there, describes it as "the steepest city in the world … unbelievable [and] dreamlike"), not to mention the capital city, Tirana. If you're willing to put up with bumpy roads and idiosyncratic transport arrangements, Albania is a rare find. Buses from Shkodër to Lake Koman depart from Café Barcelona on the corner of Rruga Skenderbeg and Rruga Marin Barleti at 6.30, 7 and 7.30am (all arriving for the ferry). International cruising giant P&O added the Albanian resort of Durres to its ports of call in 2012. The Balkans, a region once known as a hotbed of crime and violence, has become one of the safest zones in Europe according to the United Nations. “The vicious circle of political instability leading to crime, and vice versa, that plagued the Balkans in the 1990s has been broken,” said Antonio Maria Costa, head of the United Nations Office on Drugs and Crime. The bloody breakup of former Yugoslavia — the worst carnage in Europe since World War II — left the region in turmoil throughout the 1990s, but a United Nations report says the levels of crime against people and property are now lower in the Balkans than in Western Europe. The United Nations report says this trend of reduced crime is likely to continue as the region lacks the usual factors that lead to crime elsewhere in the world: mass poverty, income inequality, runaway urbanisation and large-scale youth unemployment. Albania and Croatia have officially joined the NATO military alliance. The two states became NATO’s 27th and 28th members after their ambassadors to the US filed their instruments of accession at a ceremony in Washington. Correspondents say NATO wanted to mark its 60th birthday at a summit this week with a symbolic expansion into a region which only a decade ago was at war. Albania is only a short, 45-mile hop from Italy across the Strait of Otranto — but it has always felt an age away. Occasionally, one of our national teams plays Albania in an important football match and, yes, it was mentioned a lot for its unbridled adulation of the recently deceased comedian Norman Wisdom. But that’s about it. However, the Balkan nation has been hiding a few secrets, not least its miles of beautiful Adriatic and Ionian coastline, and a landscape of soaring mountain ranges. Now the country is about to open up to foreign investment, while the Albanian tourism ministry reports fast-growing numbers of overseas visitors. British Airways has regular flights to the capital, Tirana, which take around three hours, and the international airport has been upgraded. ‘Multi-nationals are setting up businesses in and around the capital, resulting in a need for good-quality housing for locals and expatriates — and making Tirana’s property market of particular interest to overseas investors,’ says Bernard Ellis, 90MD of British-based property company Albanian Acquisitions. The city also has several universities and academies, ‘which give it a young population and a buzzing vibrant feel,’ says Ellis. There is a vast new project on Tirana Lake, where Rotterdam-based architects MVRDV are planning to create new areas including an extensive lakeshore drive. A chain of parks around the lake will be the setting for homes, terraces, outside public pools, play areas — and bridges to walk over a planned ‘blue cloud’ of Jacaranda trees. The piece de resistance is Tirana Rocks, a series of buildings clad with various types of stone so they appear like a gigantic rock formation in the lake park. Aqua Gardens is part of this lake district development, with studio, one and two-bedroom apartments as well as a residents’ swimming pool. Prices start at £30,000 for a studio and £60,000 for a two-bedroom apartment. They are for sale through Albania Acquisitions. British buyers looking for a holiday home will likely be searching along the coast, at spots such as Durres, 35 minutes from the airport, and already a favourite weekend and second-home destination for Tirana’s residents. Just north of Durres, architects Woods Bagot, who have been involved in projects in Dubai, Cyprus, London and Liverpool, are the first British firm to have designed a gated beachfront development — the Lalzit Bay Resort. With on-site amenities including spa, swimming pool, sports facilities, restaurants, bars and shops, a one-bedroom apartment starts at £44,000, and three and four-bedroom villas are from £204,500. Further south is Saranda, a major tourist hotspot set around a bay between the mountains and the Ionian Sea, with a Mediterranean climate and bustling waterfront, with bars and restaurants. The remains of the ancient city of Butrint, a UNESCO World Heritage site, is nearby, while on the Albania Riviera, ‘the coastal road between Saranda and the Llogara Pass is a wonder in itself’, according to Ismet Terziu, of property company Albania Properties. A new apartment complex on an elevated setting with sea views to Corfu and the Bay of Saranda is being built in the town. Prices start at £33,400, with 60 per cent of the apartments already sold. Paul Collins, editor of website buyassociation.co.uk which offers independent advice on buying abroad, recommends that potential buyers should ‘research the domestic and international tourism market, see what the government is doing to encourage visitors and be realistic about the investment potential’. With empty beaches and bargain prices, its Adriatic coast could be the ultimate traveler destination. Ask someone to give you their list of "paradise" destinations and Albania is probably one of the least likely places to crop up. But as I drop my bags, kick off my flip-flops and dive into a turquoise sea, the "P" word is the only way to describe what I'm seeing. Bobbing about on my back, I strain my eyes right and left in a bid to spot another human being, but all I can see is smooth white sand stretching away in both directions for about three miles. Mountains rise up just behind the beach, huddling together to increase my privacy. And as if that's not utopian enough, I've even got my own "private" beach bar, where resident mixologist Bledi rustles up mojitos for £3 a pop. In Albania, this counts as expensive. No wonder increasing numbers of backpackers are making their way over here. According to student travel specialist STA Travel, there has been a huge rise in demand for trips to the country, which was once regarded as Europe's poor relation. "We have noticed a massive increase in the number of gap-year travelers and backpackers wanting to try Albania," says STA's Ian Swain. When I went backpacking, in the late 90s, it was all about Thailand, with its talcum-powder sand, beach huts and low-key bars. But getting there required an endurance test of 15 hours in economy class, not to mention a sizable dent in the student loan. My trip to Drymades Beach involved only a three-hour flight. All right, I then had to spend a few more hours on the bus that weaves its way along the rocky mountain roads that lead south from Tirana, the capital city. But that just meant I had the opportunity to hop off en route and explore some of the country's coastal nooks and crannies. The Albanian Riviera stretches nearly 300 miles from Vlore down to Butrint, forming one of the last stretches of unspoilt shoreline in Europe. Around almost every corner there's a strip of empty sand that has managed to escape invasion by the package holiday hordes. Heading out of Tirana for the coast, one of the first places I stopped at was Orikumi, home to the ruins of an ancient village dating back to 600BC. In other countries it would all be roped off, with overpriced tickets and T-shirts on sale. Here, however, I could wander at will around the remains, crunching along a path strewn with bits of old Roman pottery. I felt like a pasty-faced Indiana Jones stumbling across a lost city. While a large proportion of Orikum (as the village was originally called) is buried under the nearby estuary, the amphitheatre, market stalls and sacrificial altar are still largely intact. From here, my route continued up into the Cika Mountains, where the smell of pine trees and hot earth wafted in through the open windows of the bus, fuelling my desire to find a beach and cool off as soon as possible. I didn't have to wait much longer. After winding up through the Llogara Pass, at 1,100m (3,609ft), the road began to weave its way down to the coast and I got my first glimpse of what the backpackers are getting so excited about. The edge of Albania stretched out into the distance, bordered the whole way along by a ribbon of white sand. The only symptoms of human "civilisation" were the domes of the machine gun bunkers scattered every few hundred metres along the shore - leftovers from the country's paranoid dictator Enver Hoxha, who died in 1985. Reaching the coast, we turned off the tiny "main" road and headed down to Palassa Beach, bouncing down a track that would break the average rental car. I wasn't about to complain about having my teeth shaken loose over the potholes, though; the lack of tarmac is the main reason why the region has yet to be gripped by the tentacles of mass tourism. The reward for those prepared to put in the effort is a three-mile stretch of beach to call your own. The only sound here is the hypnotic rattle of pebbles being raked over the shoreline. In 48BC, Julius Caesar landed here from Rome, on his way to battle Pompey at Pharsalus in northern Greece; I've a hunch it hasn't changed much since. As with most of the beaches I came across, there's nothing (and no one) stopping you from simply plonking a tent up and spending a few nights here. Do that, though, and you're in danger of missing out on Bledi's freshly made mojitos. Drymades is the next beach along, and it's here that pebbles are replaced by smooth sand and a mellow soundtrack of Cafe del Mar-style tunes. After emerging from my spontaneous dip I finally bump into another visitor. Edward is an Albanian artist looking for inspiration. "I love it here," he tells me, as we wait for Bledi to mix mojito number three. "You should see it first thing in the morning, when the sun comes up. It'll blow your mind." It wasn't just the beach bar lifestyle that brought back memories of backpacking in Thailand; the accommodation was similar, too. Tucked away in the woods behind the beach are a bunch of wooden, one-bedroom huts, with kitchens and shower rooms. They are basic but comfortable - especially when you're spending most of your time catching rays on the beach. If you do find yourself craving some civilisation (ancient or modern), you'll find it just a couple of hours' drive away, in Saranda. When the sun goes down, you can see the lights of Corfu twinkling across the water like tiny glow-worms in the distance. A few days after dragging myself away from Drymades, I sit sipping the froth off a cappuccino while fishermen putter about in the little harbour, their boats chock-full of freshly caught fish. I could happily spend the day here, watching the world go by, but this is merely a pause on the way to Butrint. The ruins of this city form an architectural index of ancient history, with Greek, Roman and Venetian remains all contained on one tiny island. Located half-an-hour's drive south of Saranda, on the edge of a beautiful blue lagoon, it was a thriving port for more than a thousand years and is now a Unesco world heritage site. Starting at sea level I amble along avenues of shady trees, working my way up through time until I reach the island's highest point. The route takes me past an ancient Roman bathhouse and Christian baptistry, before leading me up steps worn smooth by centuries of shuffling feet to the magnificent Venetian castle. In the 15th century this would have provided an important early peek at hostile visitors; now it's ideal for spotting sea eagles circling over the electric-blue water. Albania is not all old ruins and rudimentary beach huts, though. Making my way back north towards Tirana, I spend the final few nights at a boutique hotel, Rapo's, in the village of Himara. This is the first glimpse I get of Albania's potential future - one with Wi-Fi, swanky dark wood sunbeds and poolside waiter service. While it's all very nice, I can't resist sneaking off down a nearby track to find yet another deserted beach. Developers must be itching to get their hands on this place but, for now, the backpackers have it to themselves.